here’s a quickie based on a question over at the InDesignSecrets forum. how do you centre the page without changing your zoom level? but all of these change your zoom level. applescript is perfect for this kind of problem — you’ve got something that you want to do time and time again, but it’s not available in the standard package. as with most scripting solutions, you need to be a little bit cunning — if there was a ‘centre page’ command, it would be available in InDesign, but there’s not, so you have use a combination of other commands to get what you want. just save whichever version works for you into your scripts panel folder. if you don’t know how to do that — go right back and have a look at InDesign scripting : lesson 01. remember to update the first line to your version of InDesign. then, to complete the awesomeness, assign your preferred keyboard shortcut to activate the script. if you don’t know how to set your own keyboard shortcuts, you need InDesign tip : #06.
how would you change the script so that it centred on the page, but still maintained the selection? 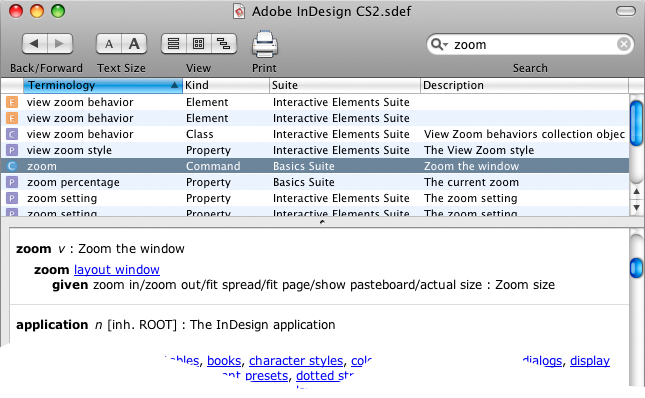 as with most InDesign features, zooming can be done in myriad ways. here are just a few. obviously there’s the magnifying glass tool which you can click on in your tool panel or, if you want to be tricky, hit ‘z’. with the magnifying tool you just click to zoom in by increments or click-drag to select an area to zoom in on. and you hold down the option key if you want to zoom out. but there’s really no need to change to that tool when you can activate it temporarily by holding down command-space (or command-option-space for the zoom-out tool). unfortunately apple commandeered this shortcut for spotlight (which I believe was just pure bloody-mindedness). but you can change the spotlight shortcut through system preferences (or, indeed, change the InDesign shortcut through edit > keyboard shortcuts). you can also use cmnd-opt-5 to quickly access the magnification dropdown menu : use your up and down arrows to zoom in and out ; or type in the percentage you want. check out how zooming with these shortcuts differs depending on whether or not you have anything selected. 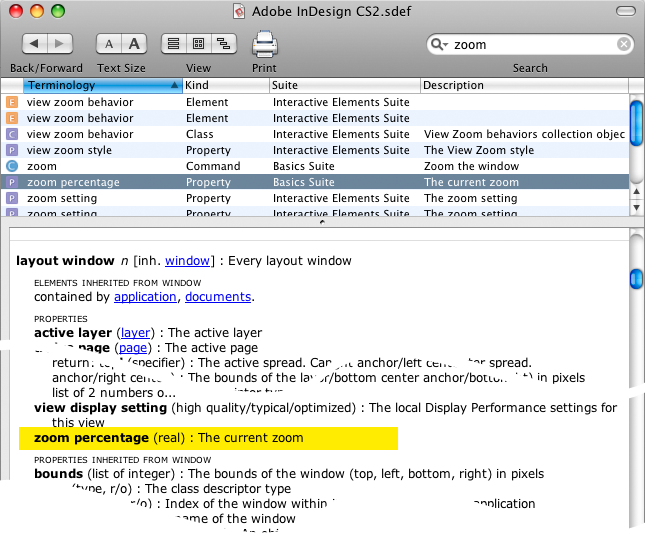 integral to zooming around the page is the hand tool — to drag another area into view when you’re zoomed in. again, there is no reason to change to this tool. in most instances you can temporarily access this tool by holding down the spacebar. the only time this doesn’t work is when the text tool is selected (for obvious reasons). if it is active in a selected text frame then you have to use the option key — if no text frame is selected you have to use option-space (go figure).